Indonesia's armed forces commander General Moeldok. 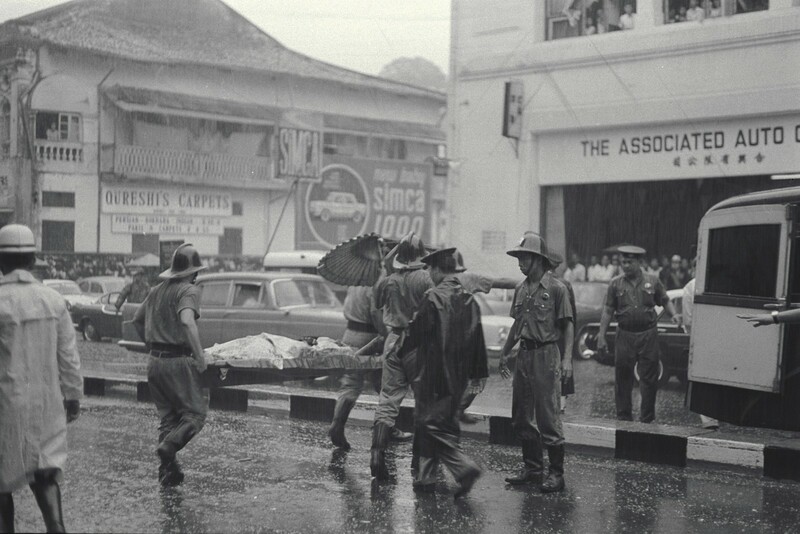 JAKARTA - Indonesia's armed forces commander, General Moeldoko, has expressed regret over the naming of a new frigate after two marines responsible for a bombing in Orchard Road in 1965. 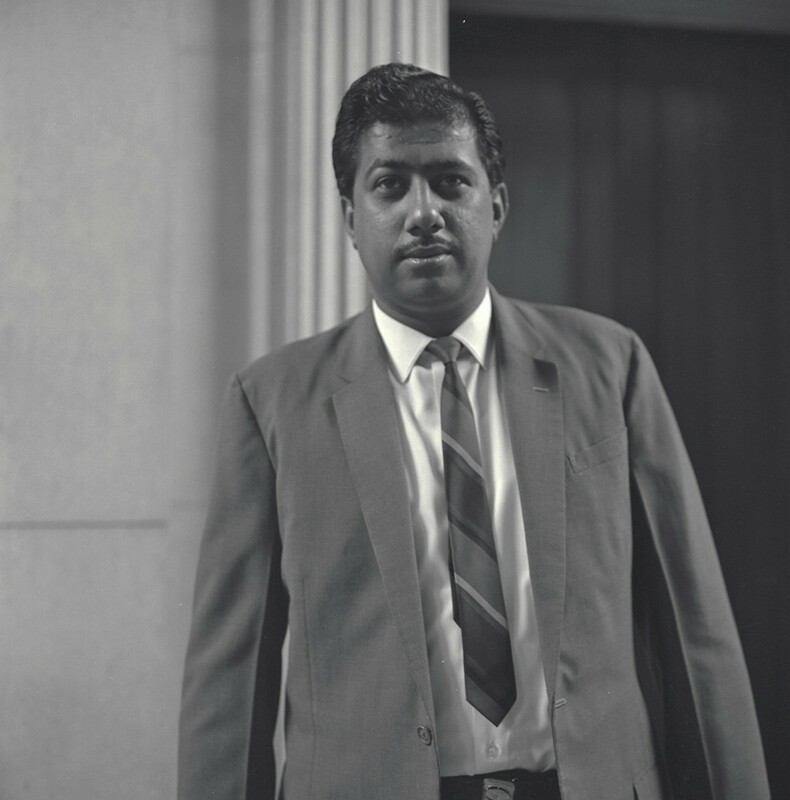 "We have no ill intent whatsoever to stir emotions. 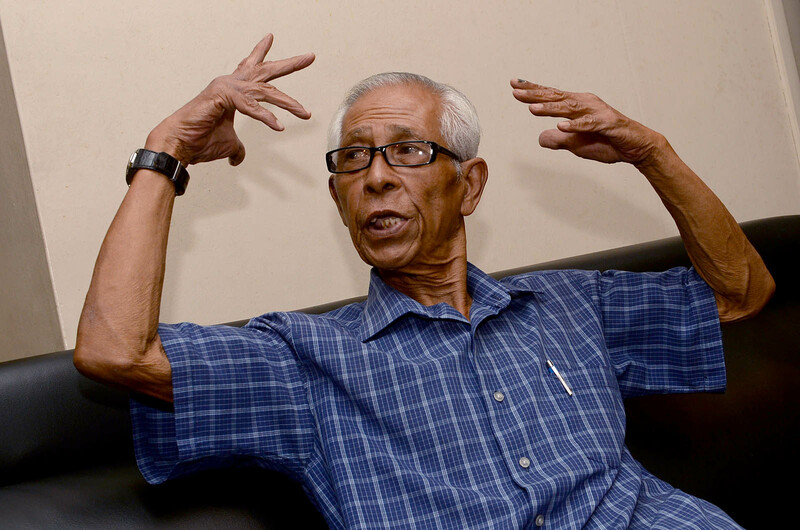 Not at all," he told Channel NewsAsia in an interview. "I apologise." Gen Moeldoko, however, said that the name of the ship would remain the KRI Usman Harun. "Relations between the two countries are on the mend," he said, adding that he had spoken with his Singapore counterpart, Chief of Defence Force Lieutenant-General Ng Chee Meng. Gen Moeldoko's apology is the first by an Indonesian military official, and signals a desire to close a chapter that has strained close military ties between the two neighbours since it was reported in February that Indonesia would name a frigate after marines Osman Mohamed Ali and Harun Said. "It shows the armed forces leadership is taking seriously its bilateral relationship with Singapore, and possibly trying to close this chapter," Dr Terence Lee of the National University of Singapore told The Straits Times. The Singapore Armed Forces (SAF) and Indonesian Armed Forces (TNI) have established strong ties since the 1970s and conduct a host of regular bilateral exercises. Gen Moeldoko's comments are the clearest sign yet that Jakarta wants to restore the relationship. 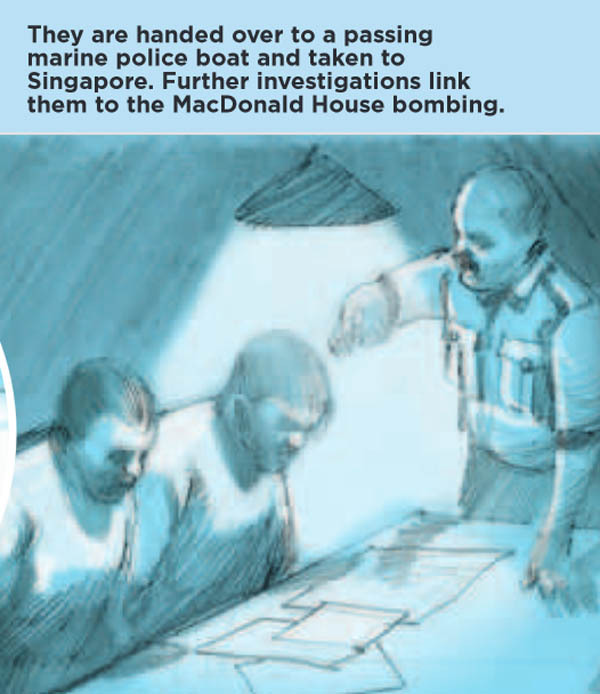 The marines were convicted for the MacDonald House bombing that killed three civilians and injured 33. 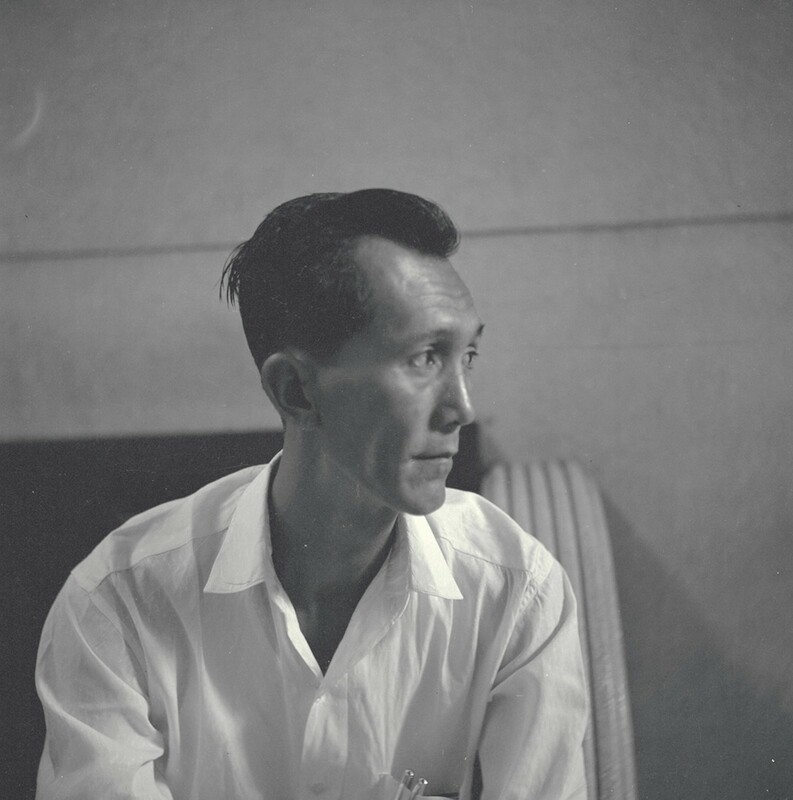 They were executed in Singapore in 1968, prompting tensions with Indonesia, which called them heroes and buried them with full military honours. 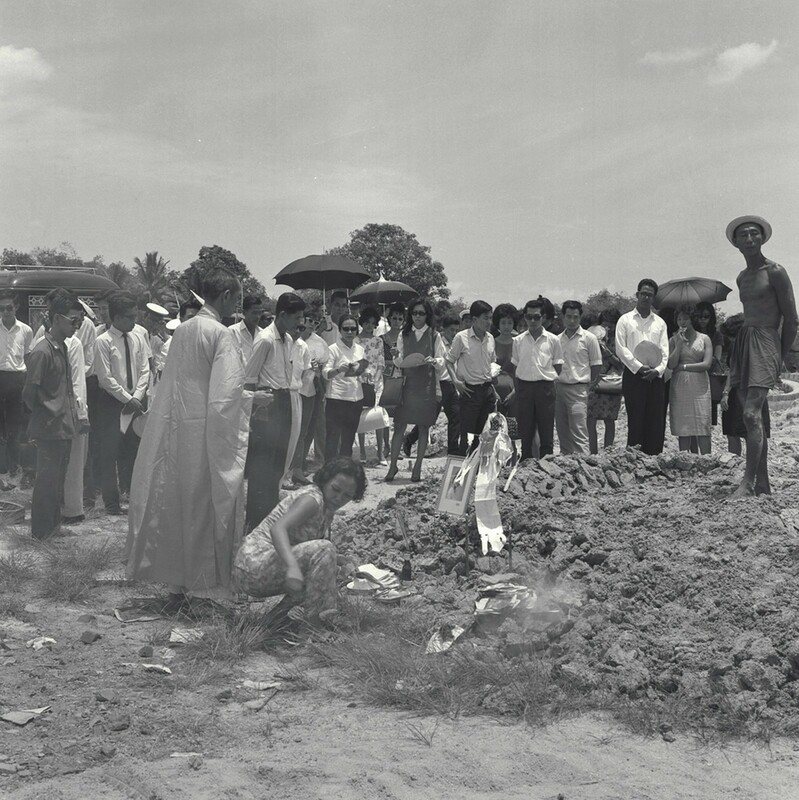 Both sides closed this chapter in 1973 when then Prime Minister Lee Kuan Yew sprinkled flowers on their graves during a visit to Jakarta. The February report drew protests from Singapore, and Singapore ministers told their counterparts the move would reopen old wounds. Defence Minister Ng Eng Hen told Parliament in February the ship would not be allowed to stop at Singapore ports or naval bases, and it would not be possible for the SAF to sail alongside or train with the KRI Usman Harun. "We want good bilateral defence and close military-to-military ties with Indonesia," Dr Ng had said. "But strong defence ties can be built only on mutual trust and respect, expressed through appropriate acts that underscore friendship and amity." 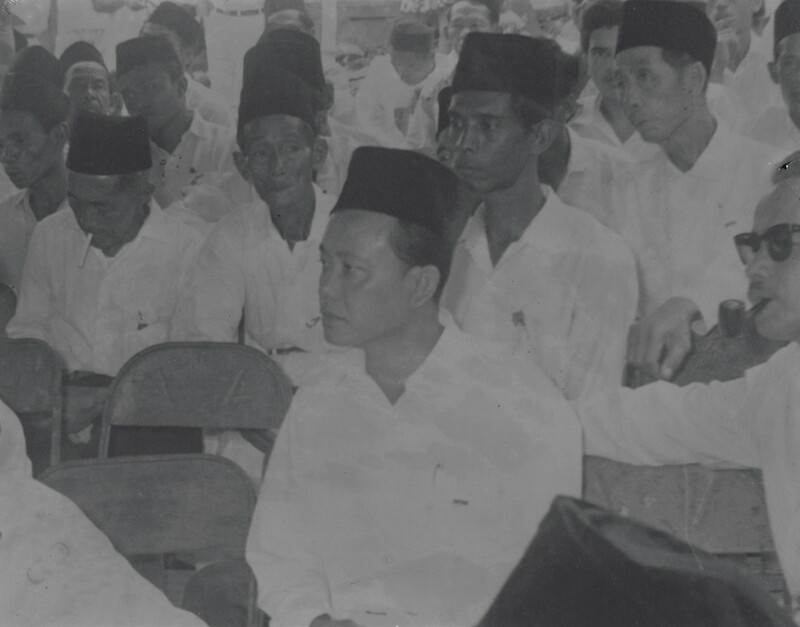 Indonesian ministers maintained that the naming, decided much earlier, was in line with the navy tradition of naming ships after the country's heroes, and that no ill will was intended. The issue resurfaced last month when two Indonesian marines posed as the bombers at an international defence conference in Jakarta. 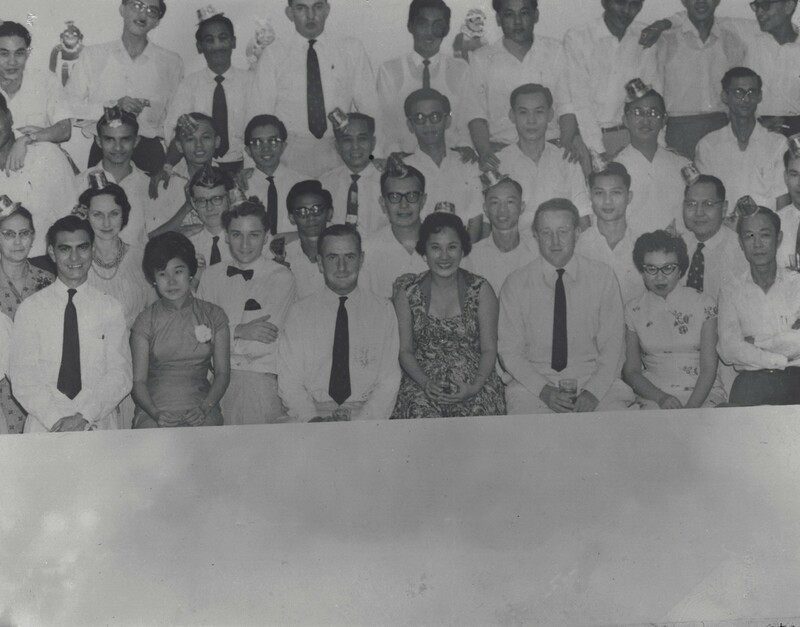 The SAF delegation withdrew from the event and returned to Singapore. Indonesia's Coordinating Minister for Political, Legal and Security Affairs, Mr Djoko Suyanto, expressed regret over the incident and the inappropriate conduct of the men. Gen Moeldoko noted that Singapore took part in a multilateral naval exercise that Indonesia hosted off Batam and the Natunas late last month, and said this was a positive step to rebuilding ties. He also said in the interview on Monday that although there was no intention to stir emotions, "there are sensitivities that we did not foresee and it escalated". "It is my responsibility as the Commander-in-Chief of the TNI to offer clarification and to take steps to ensure that the situation does not escalate," he said. 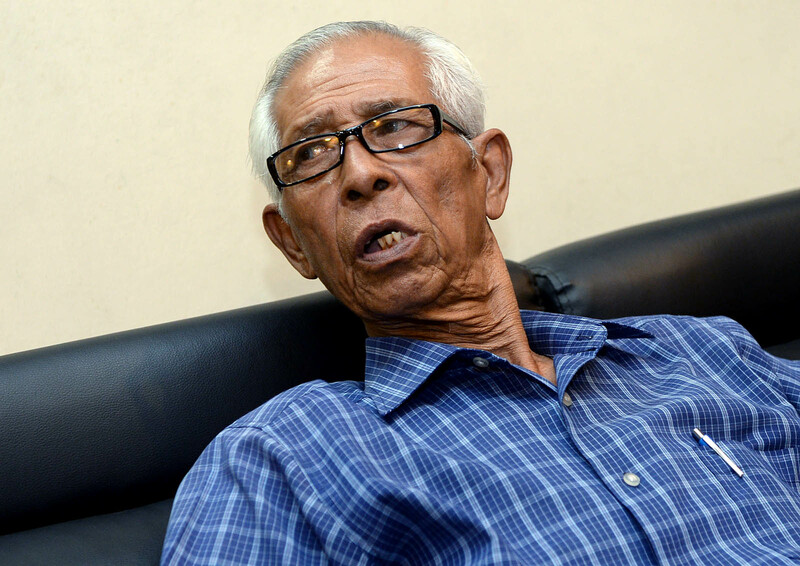 Mr Zainal Kassim, 75, is not afraid of walking past or entering MacDonald House at Orchard Road, where he was injured in a bombing on March 10, 1965. He was 26 then. 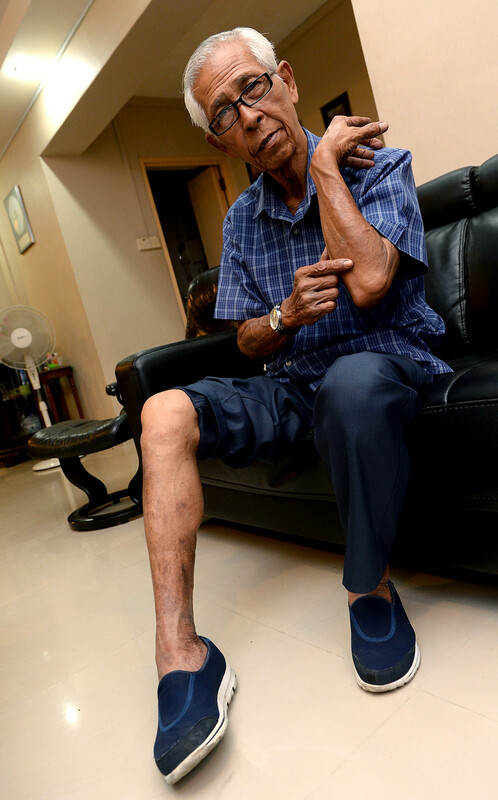 Forty-nine years on, his arms, legs and head still bear keloid scars. 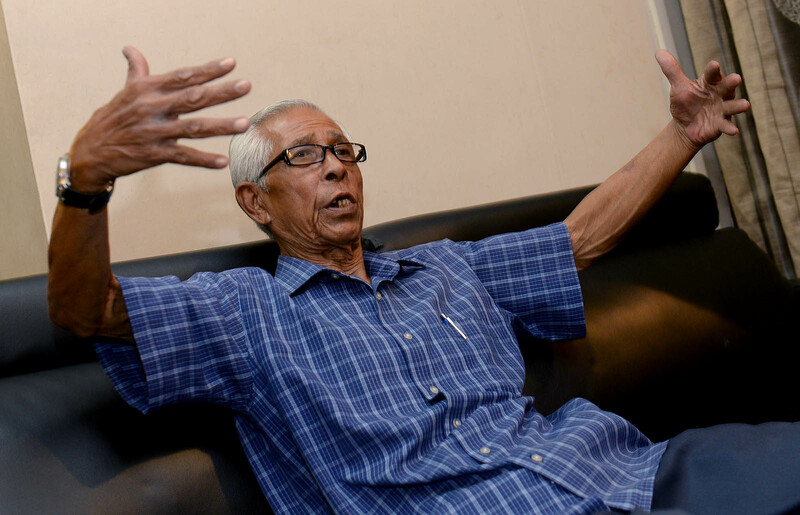 The chauffeur told The New Paper in an exclusive interview on Tuesday that he is not angry over what happened. But the news last week of Indonesia naming a navy ship after the two men responsible for the bombing has left him confused. 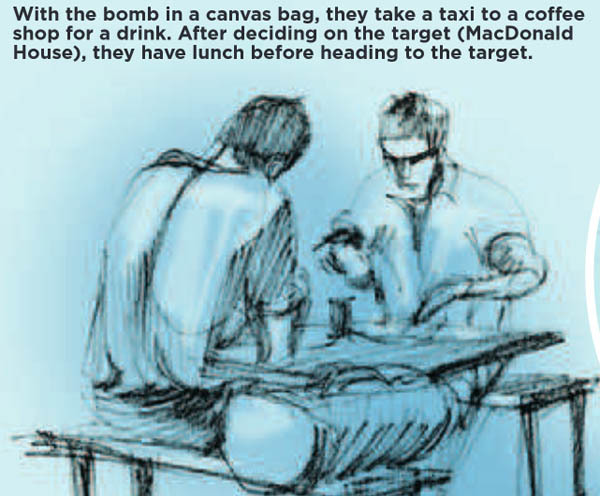 With the bomb in a canvas bag, they take a taxi to a coffee shop for a drink. 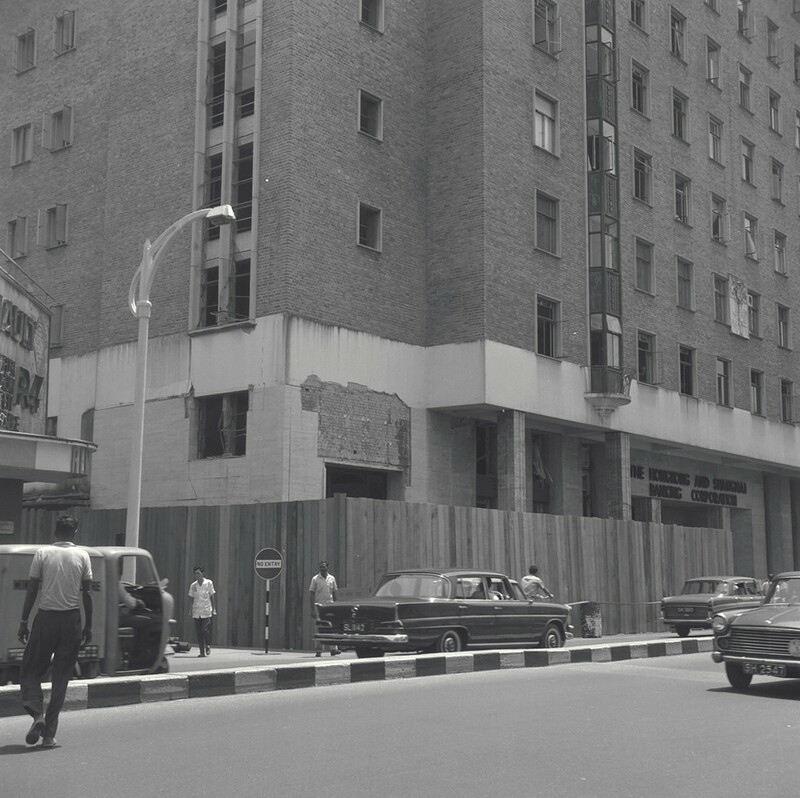 After deciding on the target (MacDonald House), they have lunch before heading to the target. 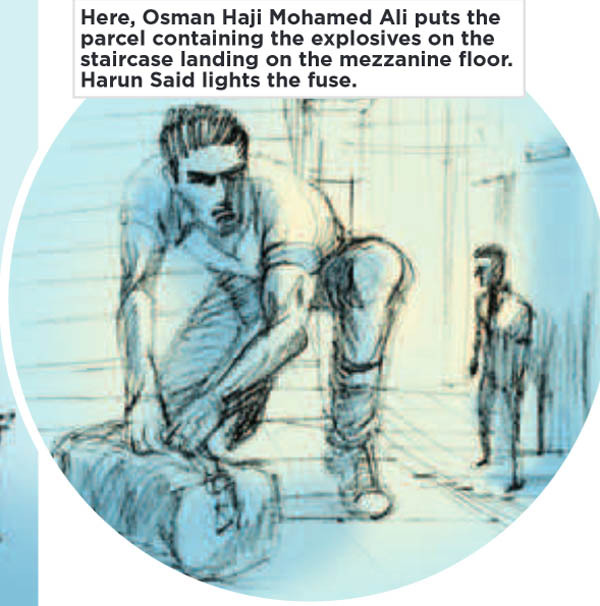 Here, Osman Haji Mohamed Ali puts the parcel containing the explosives on the staircase landing on the mezzanine floor. Harun Said lights the fuse. Bomb detonates. 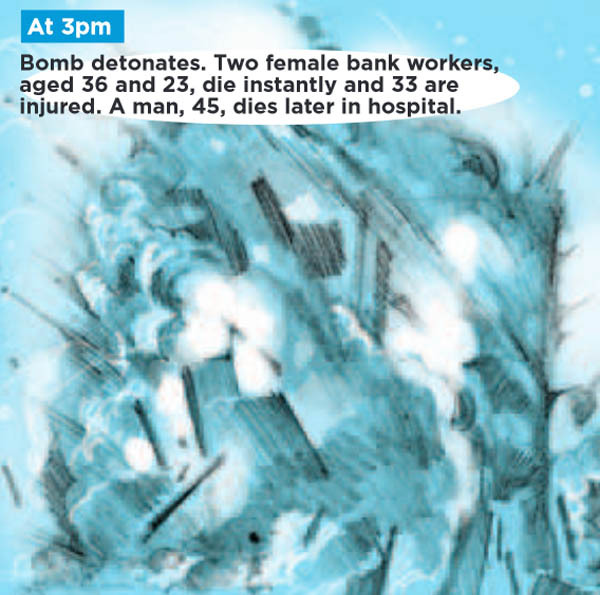 Two female bank workers, aged 36 and 23, die instantly and 33 are injured. A man, 45, dies later in hospital. 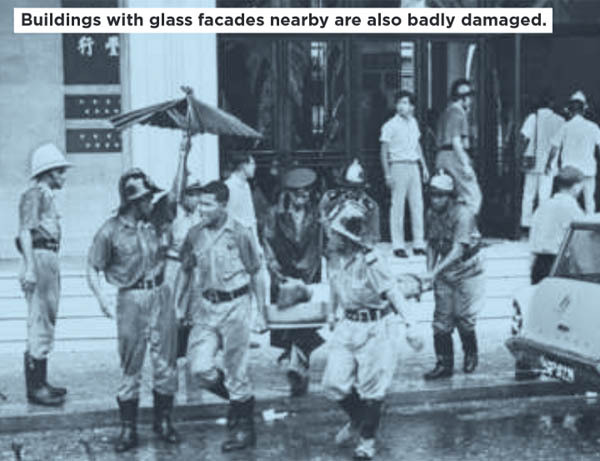 Buildings with glass facades nearby are also badly damaged. 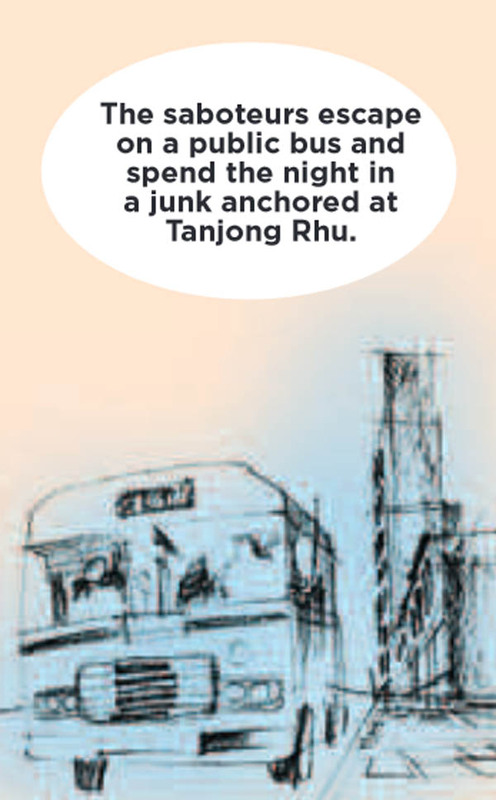 The saboteurs escape on a public bus and spend the night in a junk anchored at Tanjong Rhu. 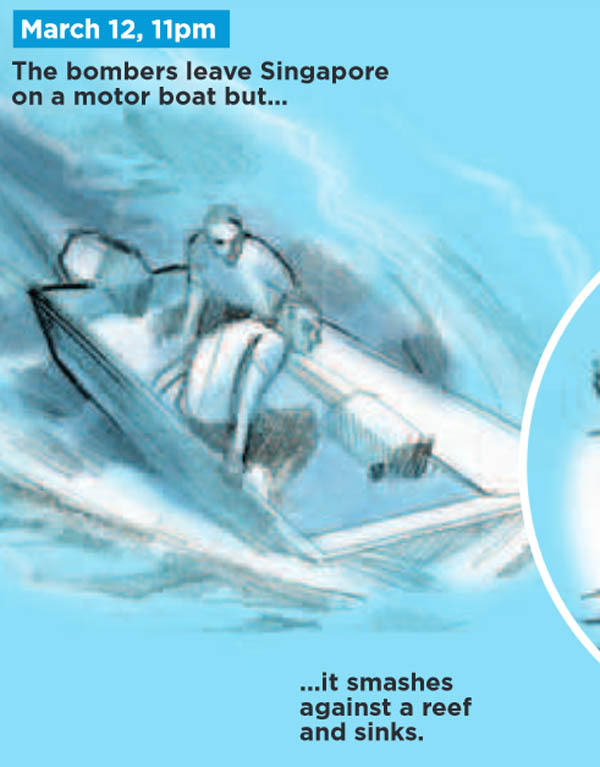 The bombers leave Singapore on a motor boat but it smashes against a reef and sinks. They float using planks. 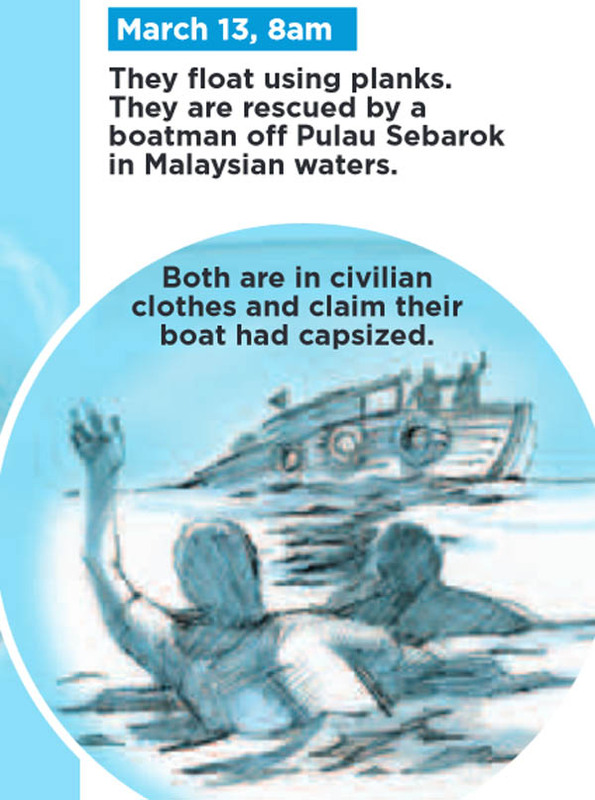 They are rescued by a boatman off Pulau Sebarok in Malaysian waters. 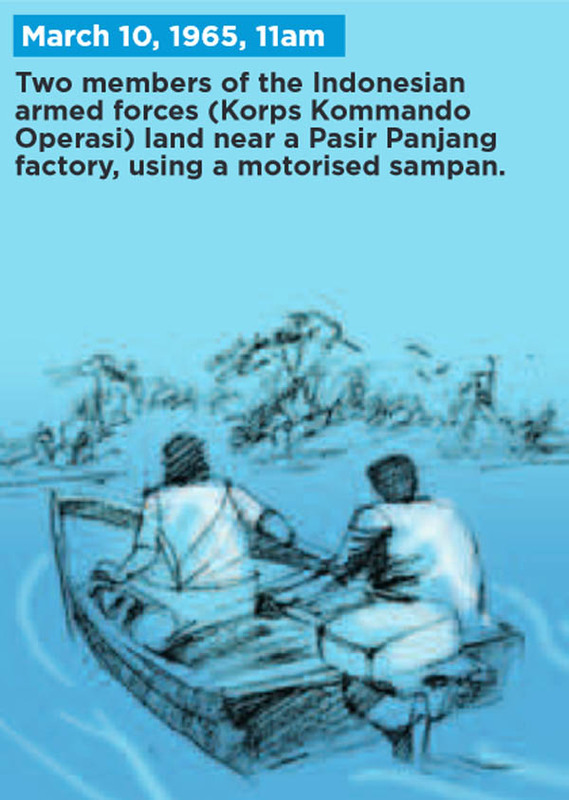 Both are in civilian clothes and claim their boat had capsized. 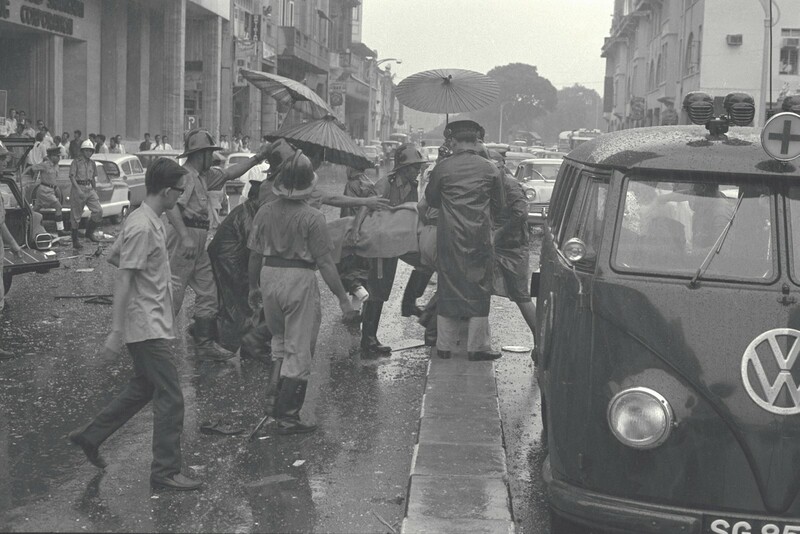 They are handed over to a passing marine police boat and taken to Singapore. 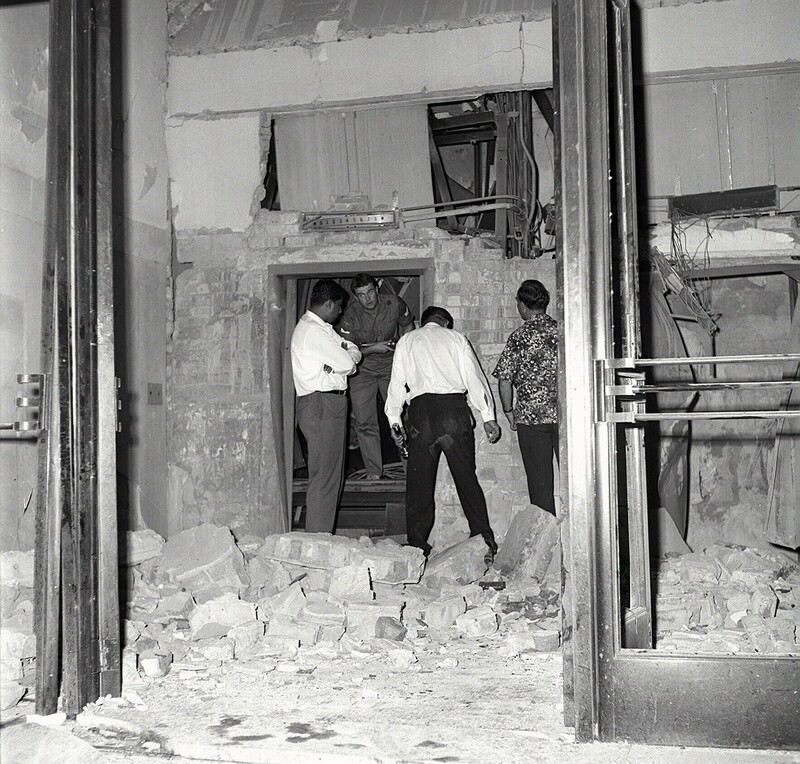 Further investigations link them to the MacDonald House bombing. After a 13-day trial, both are found guilty of three murders and sentenced to death. 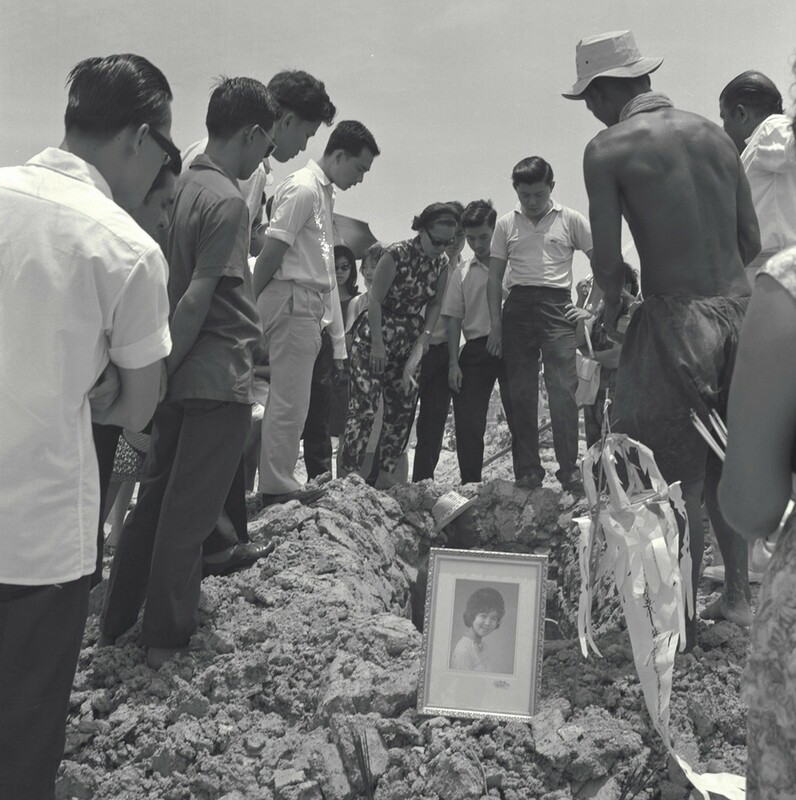 They are hanged on Oct 17, 1968. 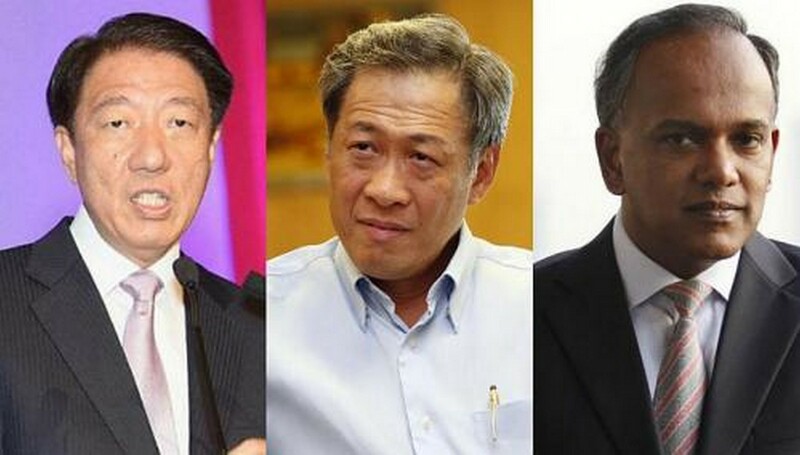 Combination photo of Deputy Prime Minister Teo Chee Hean, Defence Minister Ng Eng Hen and Foreign Affairs Minister K. Shanmugam. 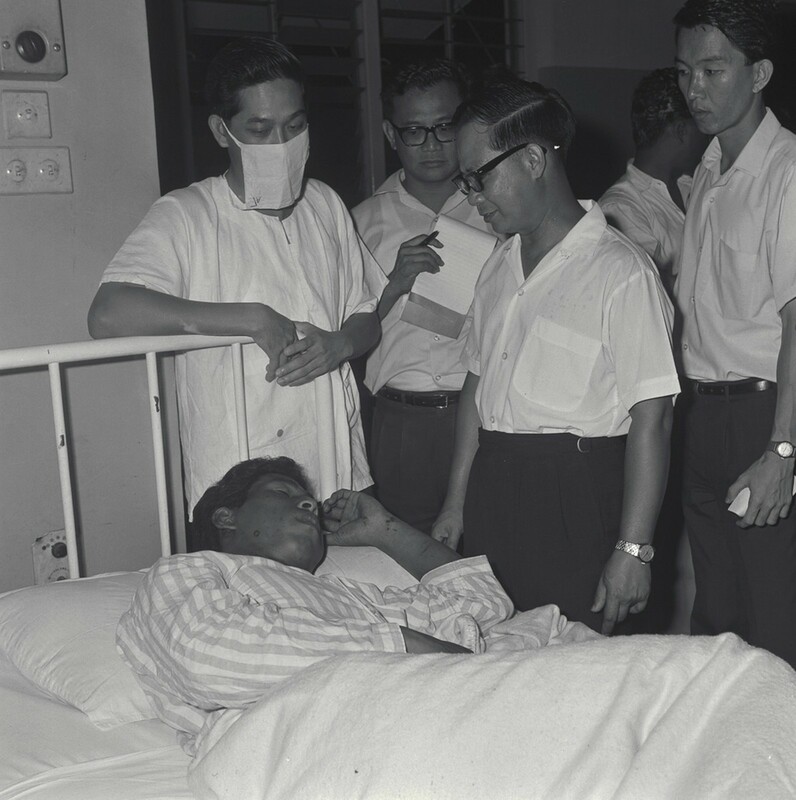 The Singapore ministers are asking Indonesia to consider the feelings of Singaporeans in its decision to name a Navy ship after the Indonesian marines who bombed an Orchard Road building in 1965. Osman Haji Mohammed Ali, 25, and Harun Said, alias Tahir, 21, (third and fourth from left) were charged with having "knowingly caused" the deaths of three persons. The incident has been making the headlines again because Indonesia named a navy ship after the two men responsible for the attack. 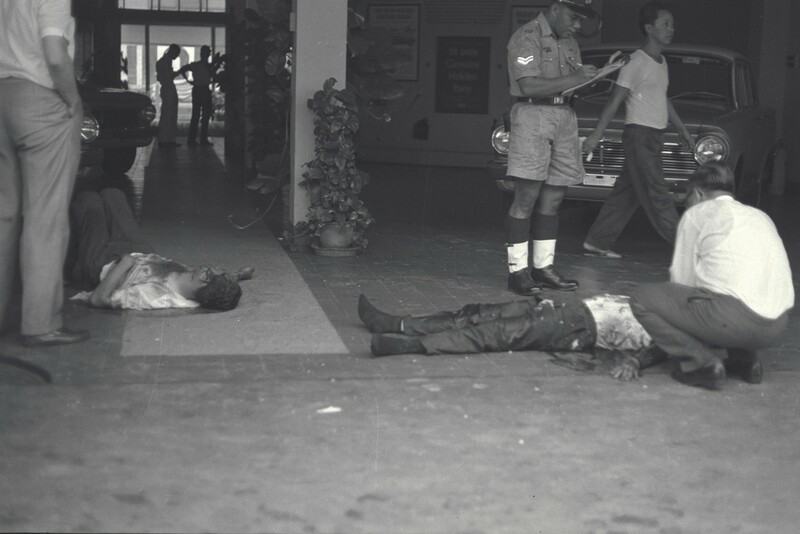 A 25lb (11.33kg) package of nitroglycerine, with a timing device, was planted on the mezzanine floor, near the lifts. 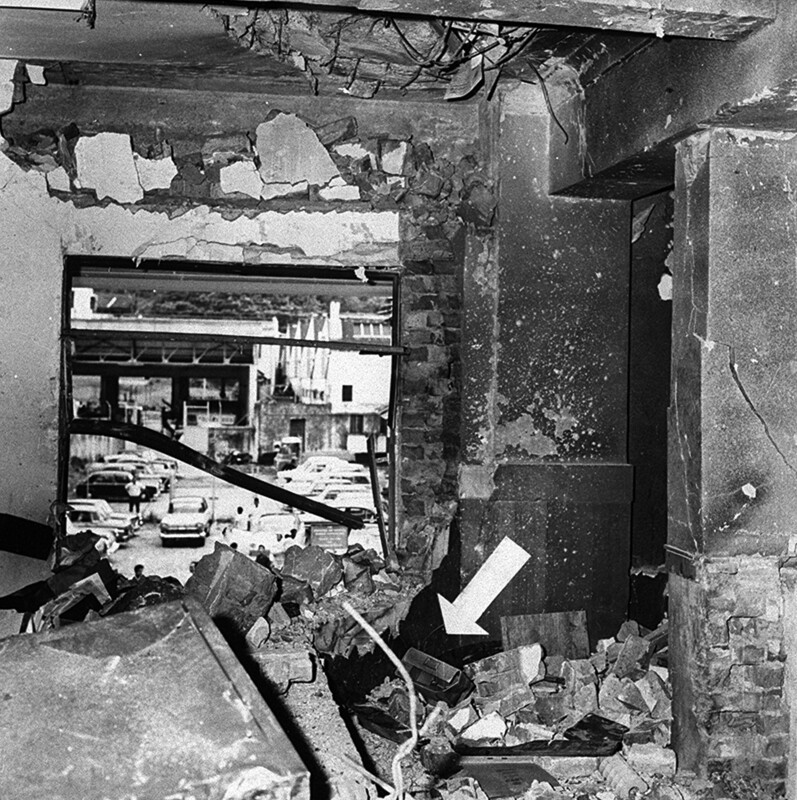 Arrowin the picture points to the exact spot on the stairway at the mezzanine floor of Macdonald House where the time-bomb exploded. 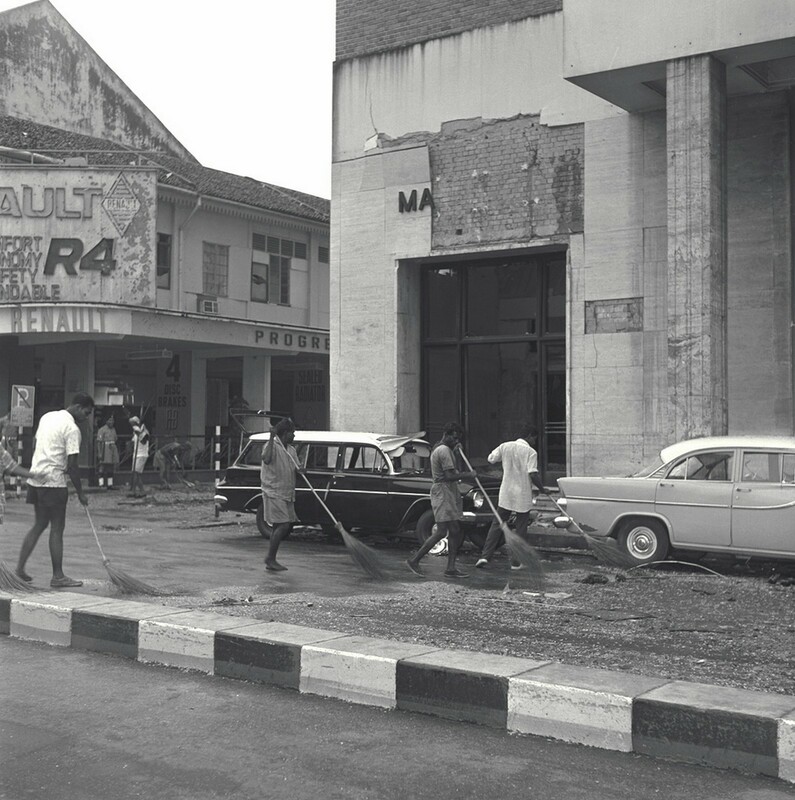 The concrete wall separating the stairway and the correspondence room of the Hongkong and Shanghai Bank was completely demolished exposing a view of the bank's car park on the other side of Orchard Road. 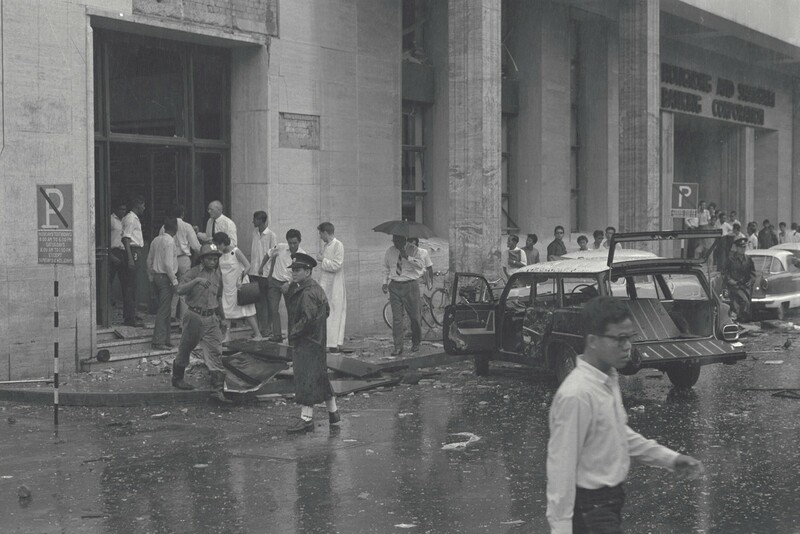 At 3.07pm on March 10, 1965, the bomb exploded. 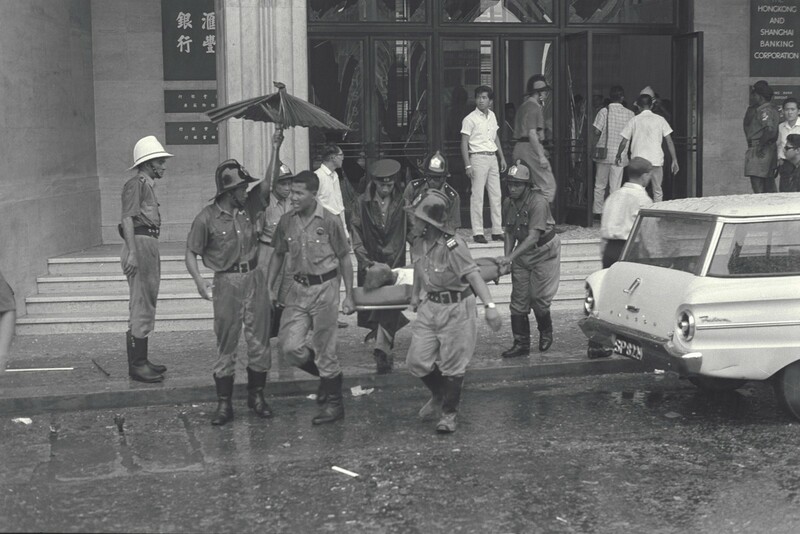 The explosion tore a hole in the floor, ripped out a lift door and reduced the correspondence room of the Hongkong And Shanghai Bank "into a shambles." 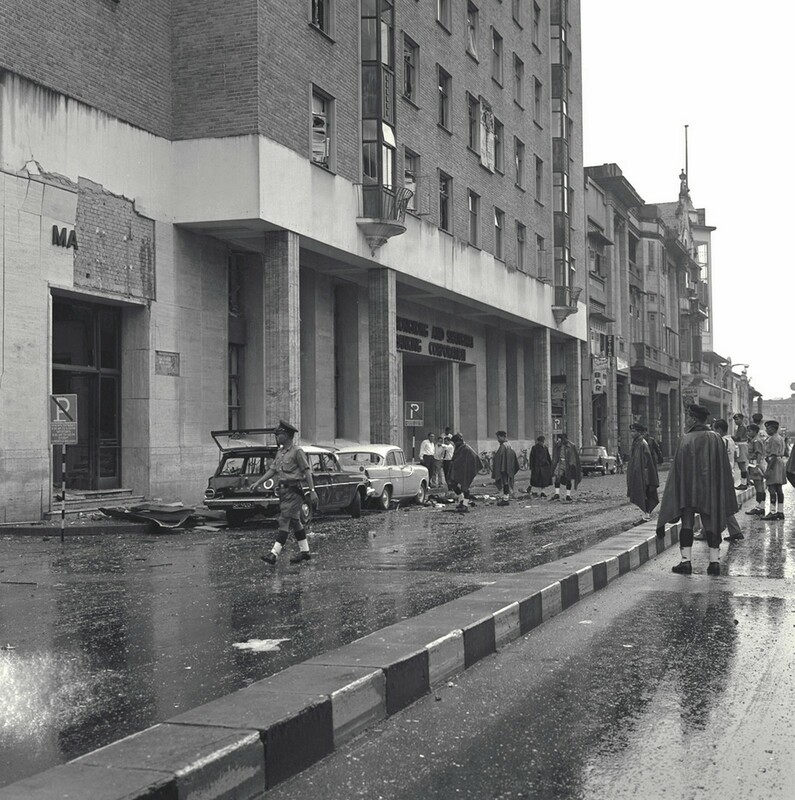 Sweepers cleaning the road in front of Macdonald House after the explosion which torn out the door of one of the lifts. 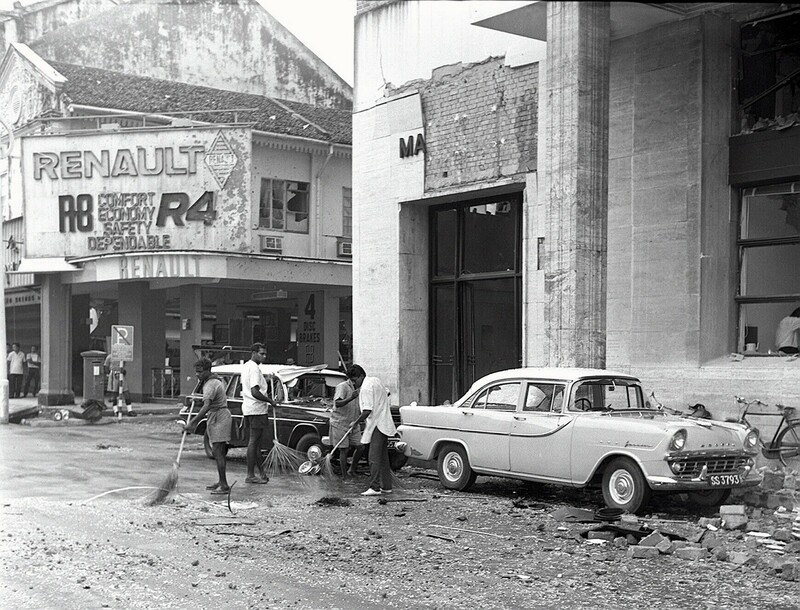 Workers clearing away the rubble. 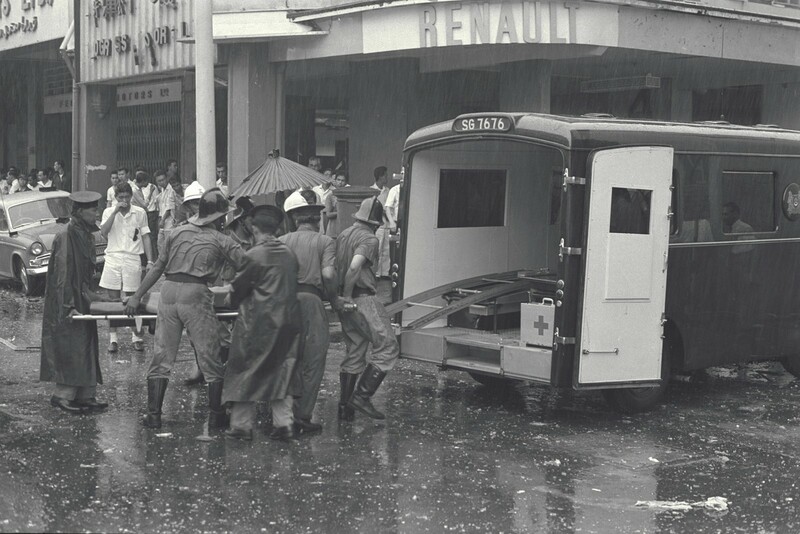 Three people died, and 33 people were injured. 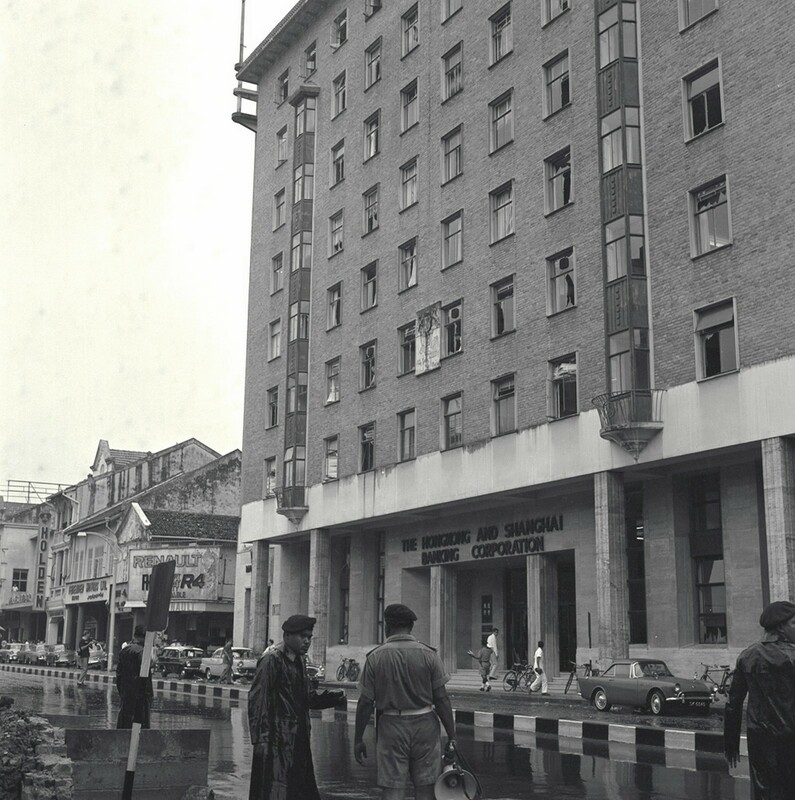 The March10 attack on MacDonald House happened at the height of Indonesia's Confrontation against newly formed Malaysia, which then included Singapore. 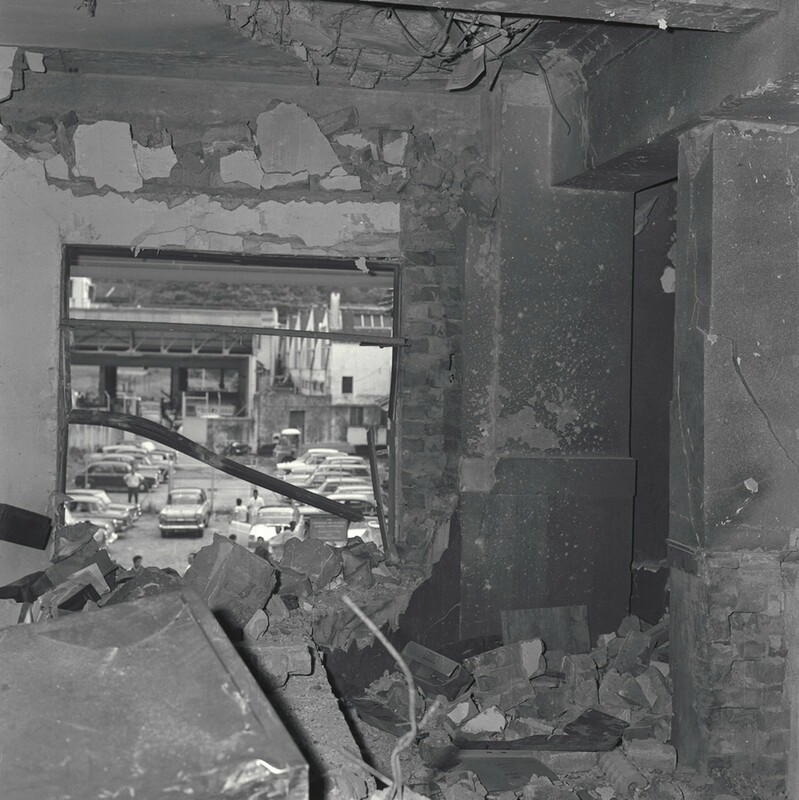 The extent of the damage on the mezzanine floor of the 10-storey building made it a simple matter to determine where the bomb was placed near the lift. 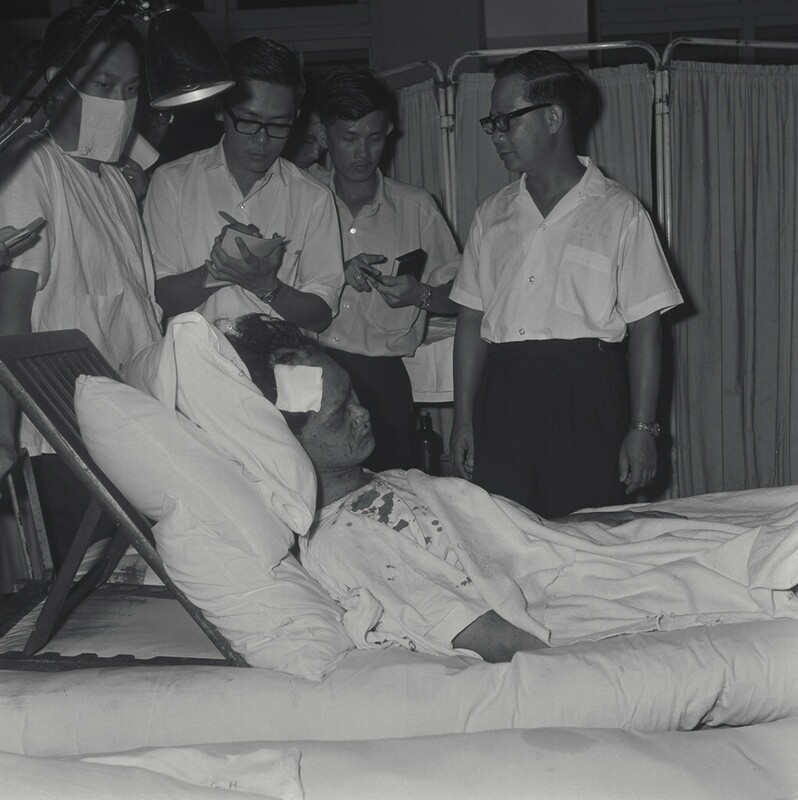 Mr Lim Chin Hin, the compradore of the Hongkong and Shanghai Bank had a narrow escape when a bomb exploded at Macdonald House in Orchard Road. 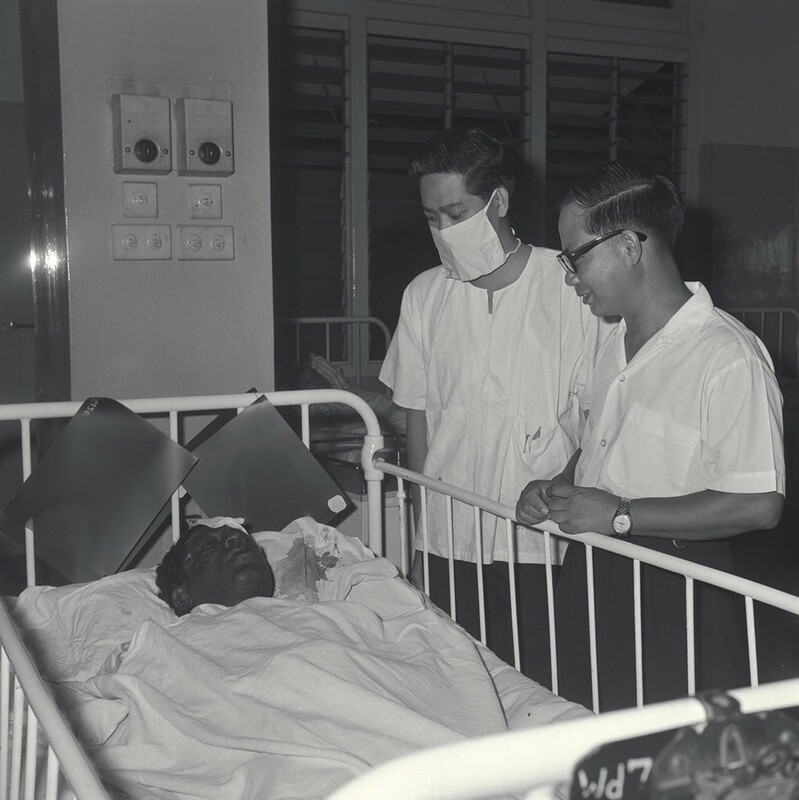 Then Deputy Prime Minister Dr. Toh Chin Chye called on victims of the explosion. 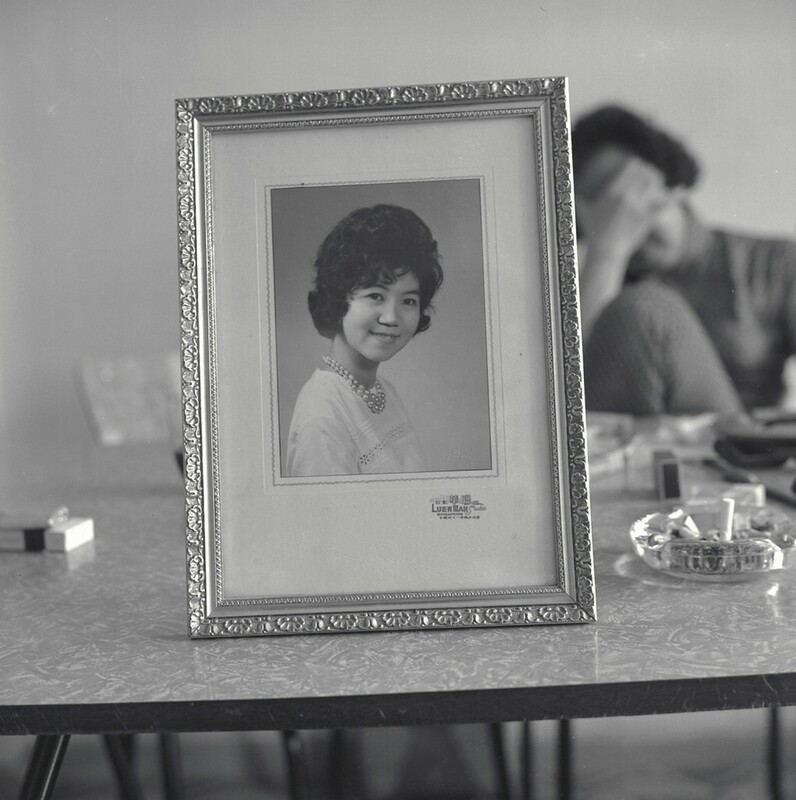 Juliet Goh Hwee Kuang, 23 and an only child, was killed in the blast. 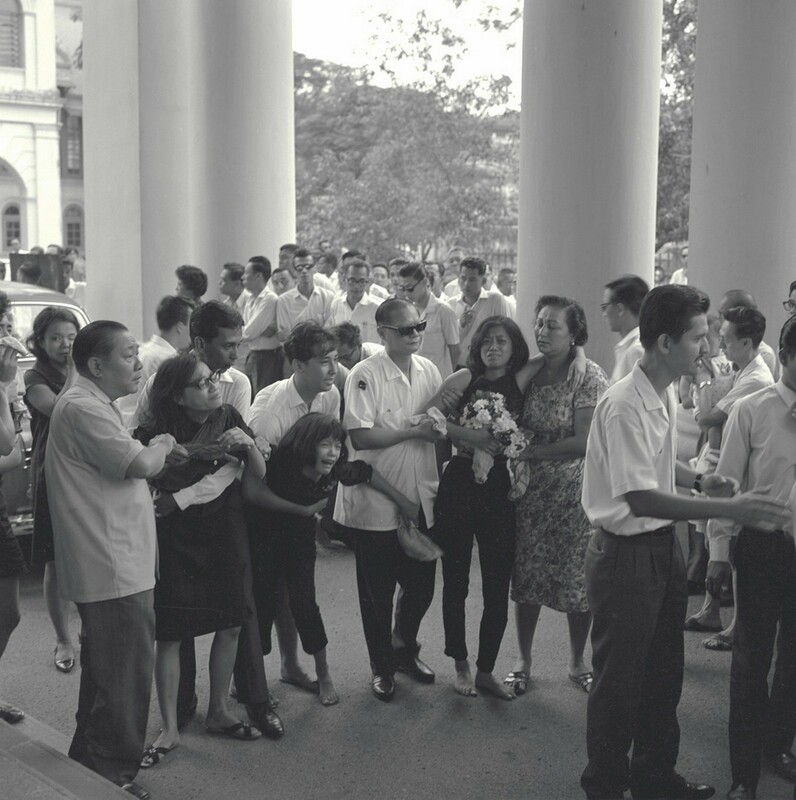 Funeral of Juliet Koh who died in a bomb explosion at MacDonald House. 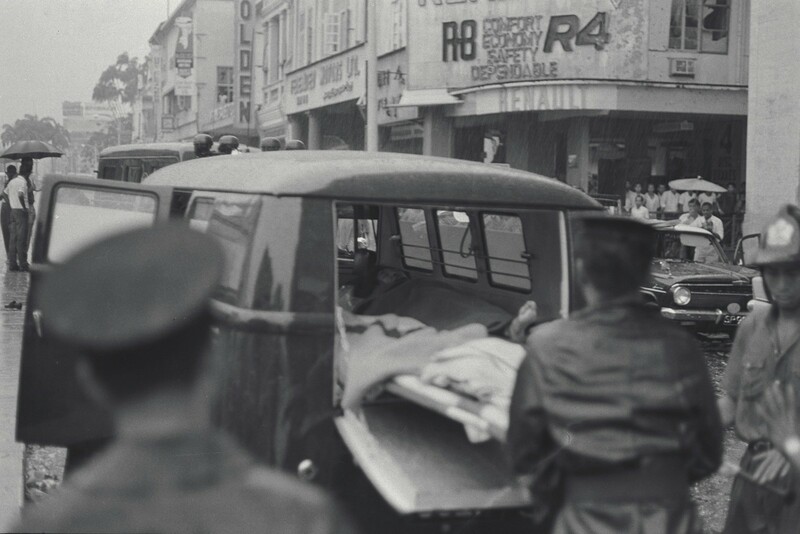 Funeral of Juliet Koh who died in a bomb explosion at bombing at Macdonald House. 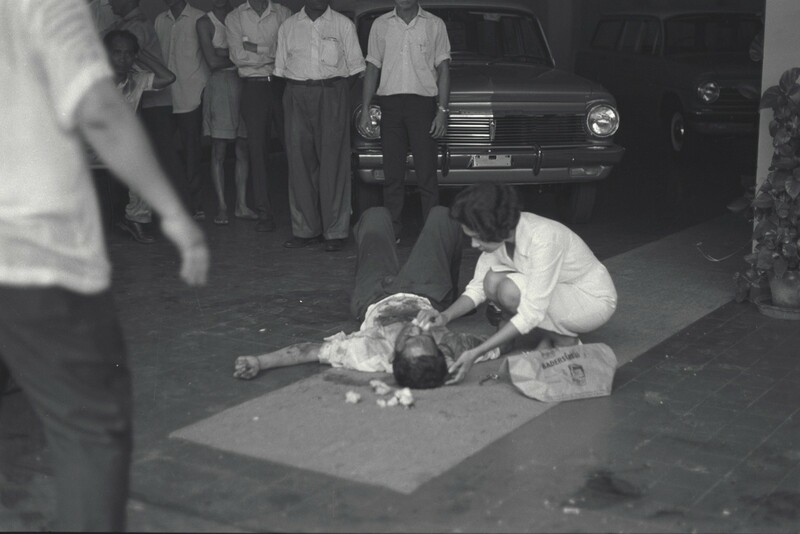 Elizabeth Suzie Choo Kway Hoi, 36 and mother of six who was private secretary to the manager of the bank, died in the blast. 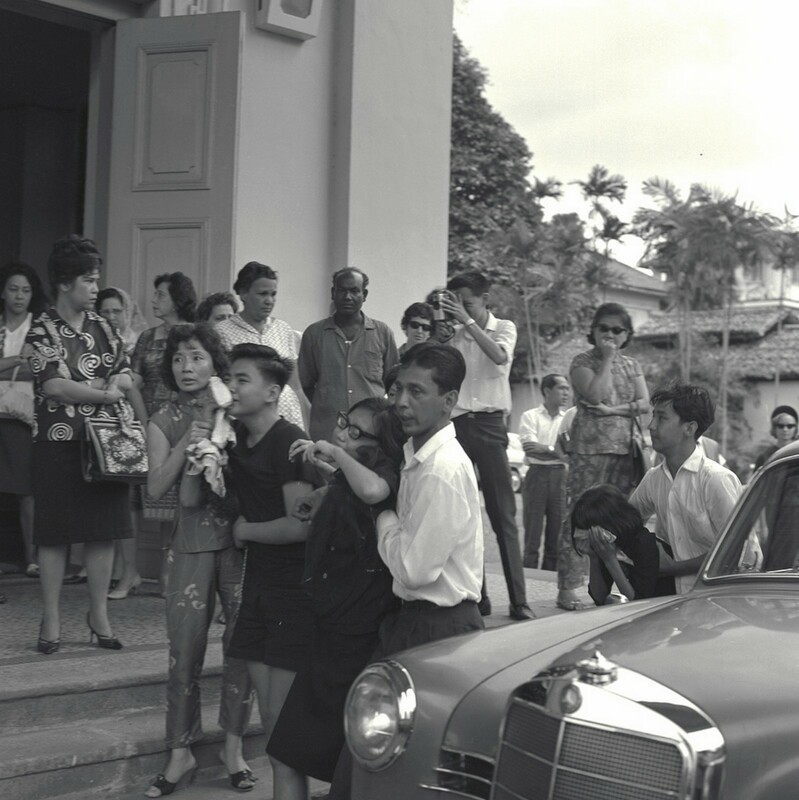 Children and relatives of Madam Elizabeth Suzie Choo, a victim of the MacDonald House explosion at her funeral service. 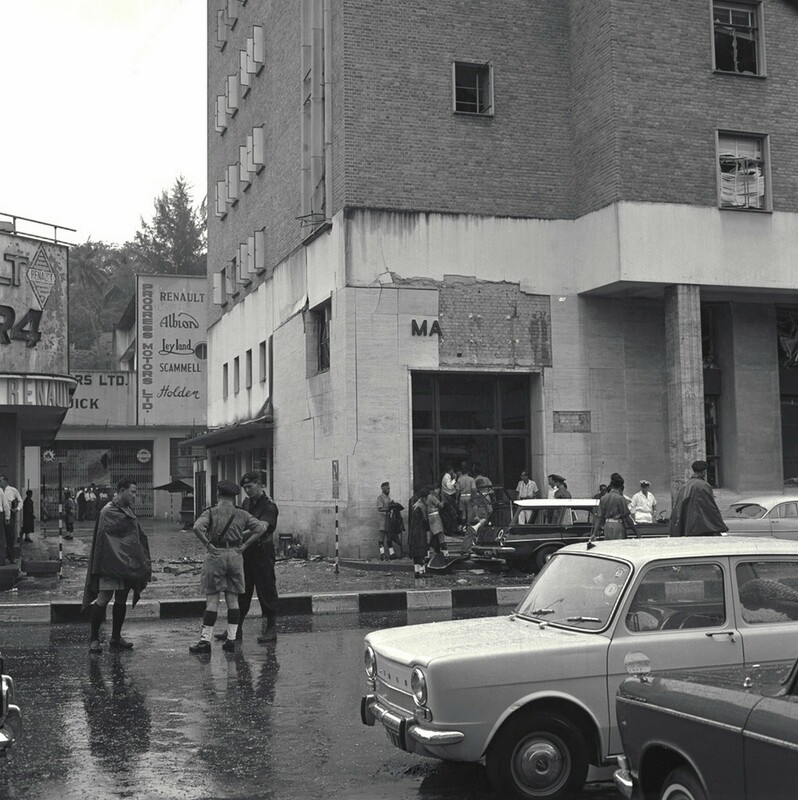 The MacDonald House bombing claimed a third victim with the death of Mohammed Yasin bin Kesit, 45, a car driver. 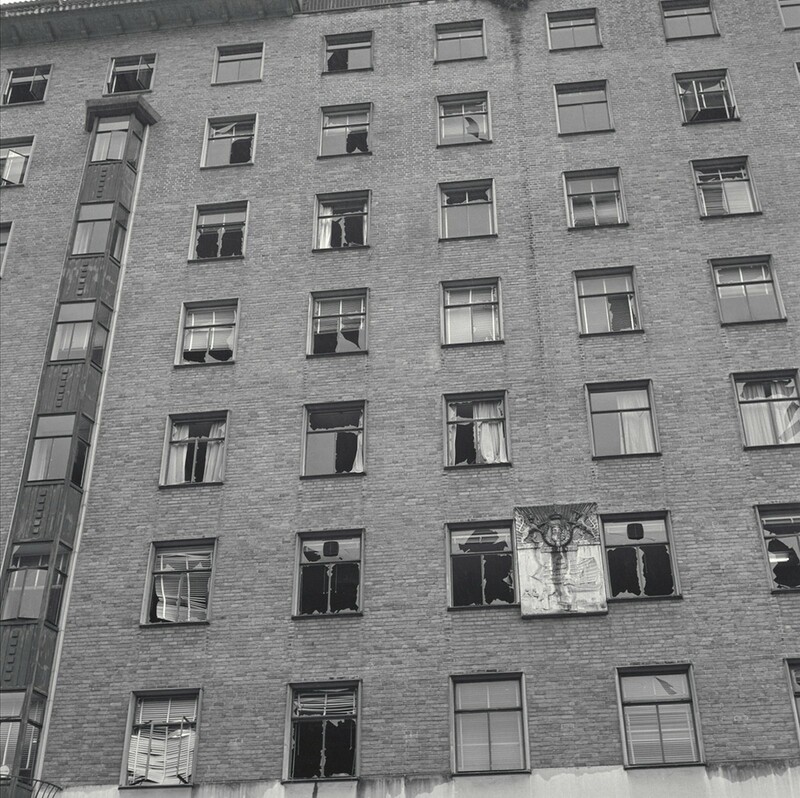 Damage in different parts of MacDoanld House caused by a time bomb. 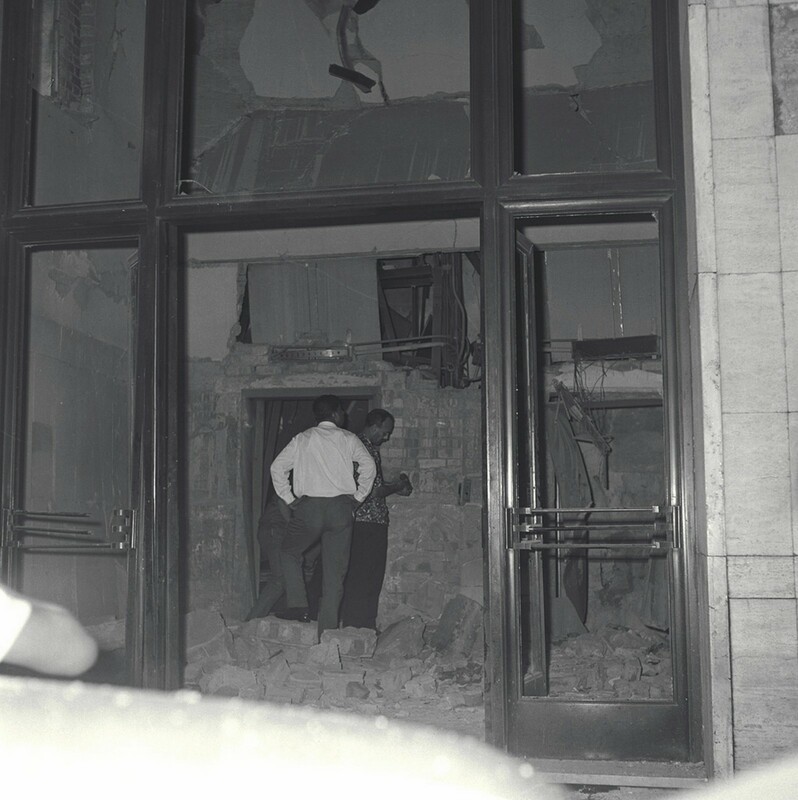 A cloud of plaster and bricks had rained onto the employees in the bank. 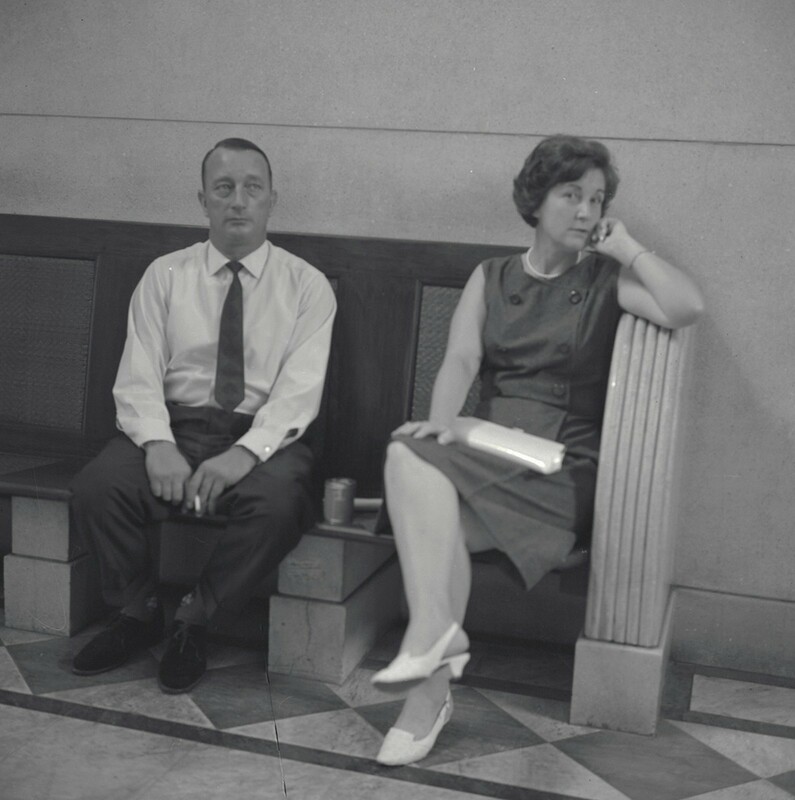 At that time, about 150 employees were finishing up for the day, as the bank had closed seven minutes earlier. Orders were given to hundreds of workers still at their desks on the upper levels to evacuate the building. Staff were instructed to evacuate via the the fire escape at the back of the building. 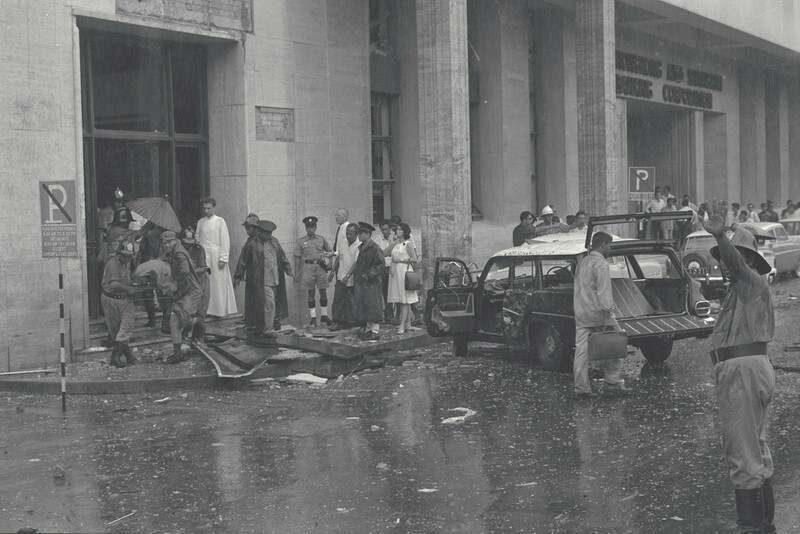 Outside, nearly half the road in front of the building was blocked by a damaged station wagon, with the other half by a wrecked car belonging to the Japanese Consulate. 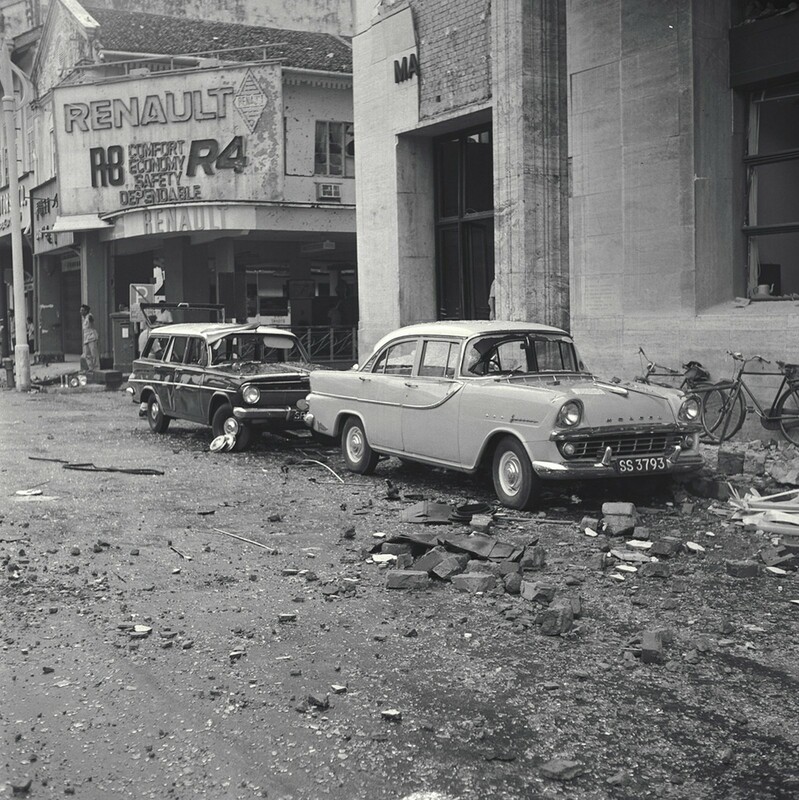 Both were damaged by the blast. 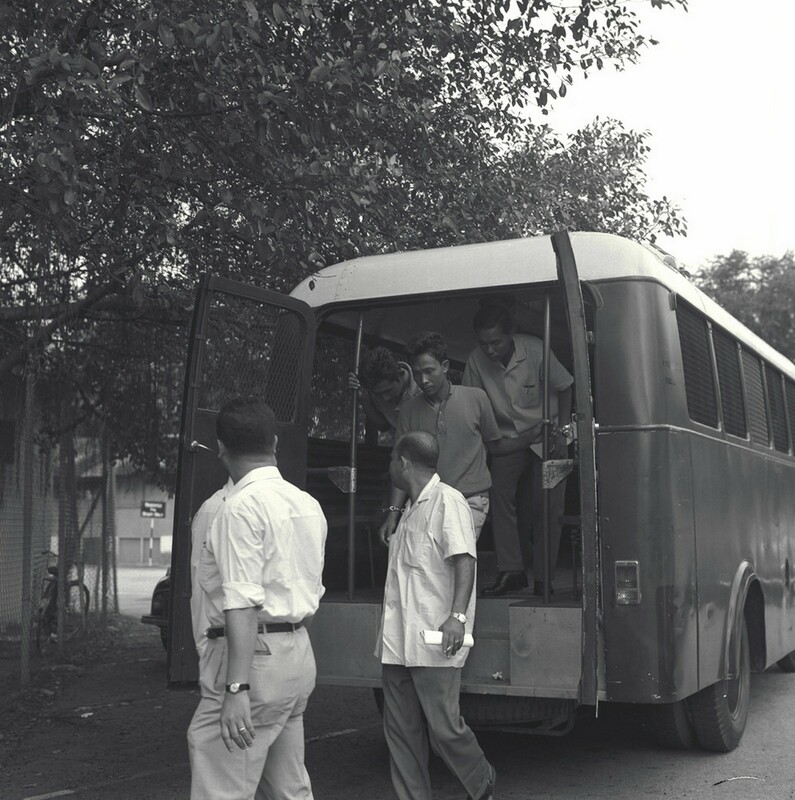 Within minutes, at 3.30pm, the Reserve Unit, which specialised in crowd and riot control, arrived. 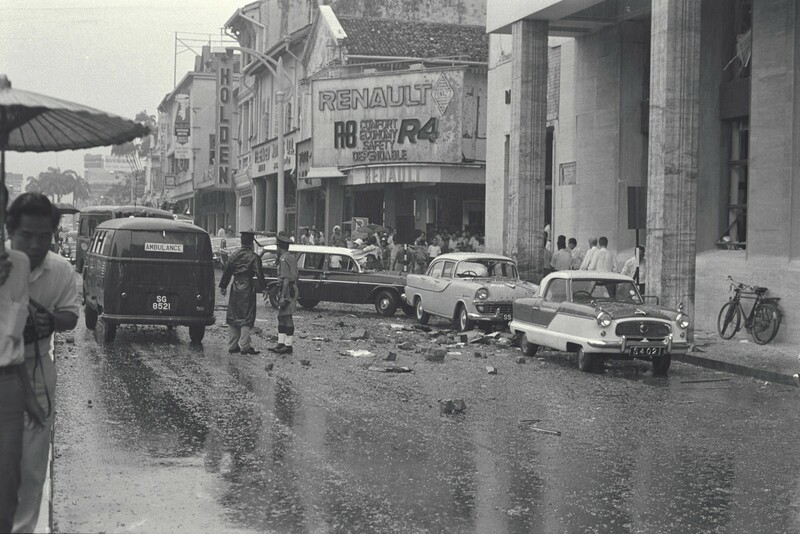 Police took up positions on both sides of the road to prevent looting. 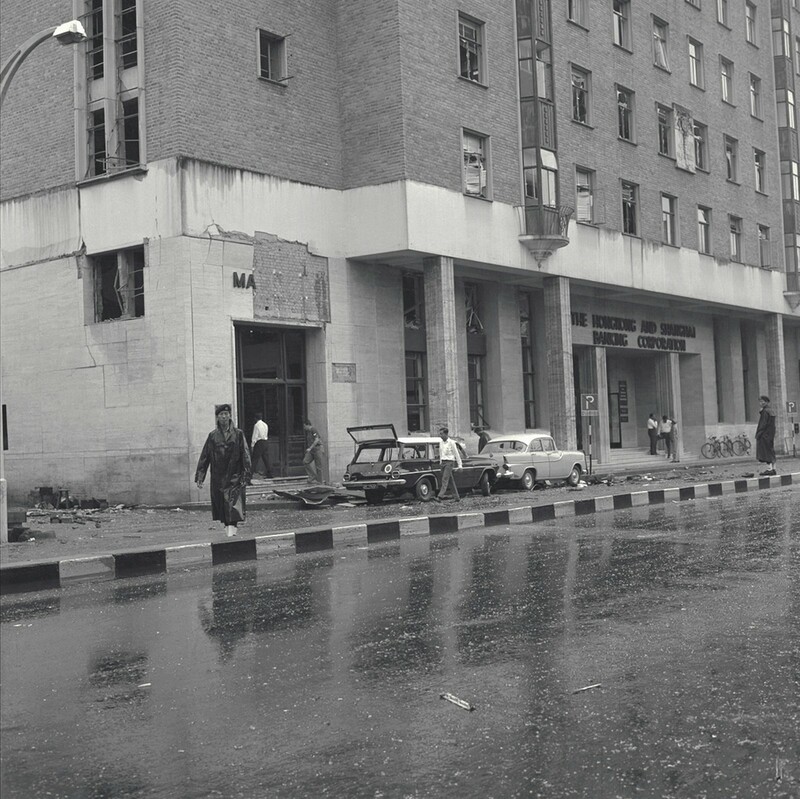 After the building was cleared, only policemen and foreign correspondents were permitted to go near the bank. The case of two Indonesians charged with the murder of three workers in MacDonald House in Orchard Road came up for mention in the ninth Magistrate's Court a week after they were first charged. 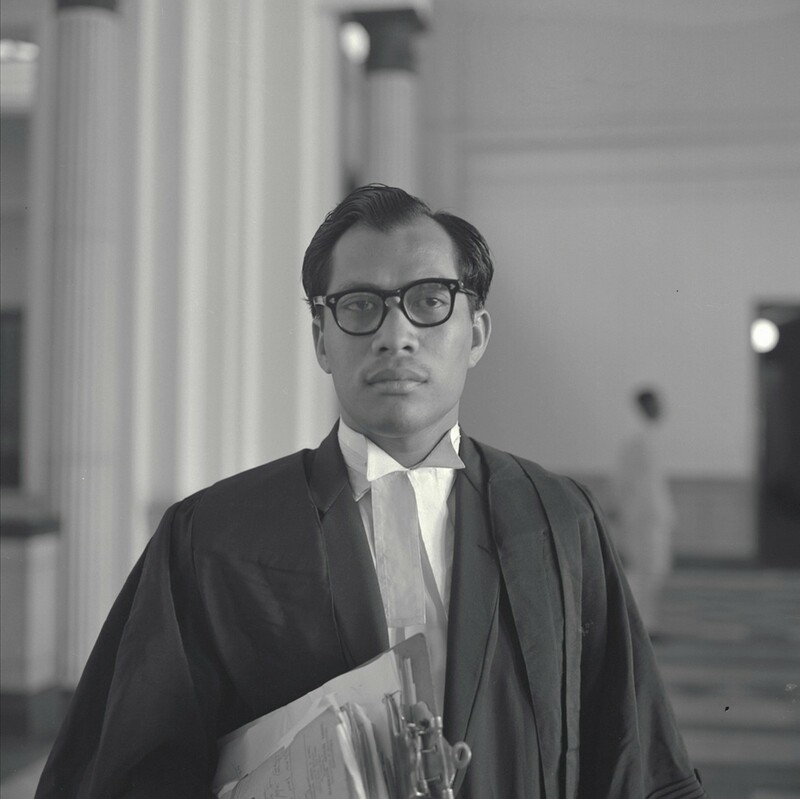 Kamil Suhaimi, the counsel for two Indonesians charged. Acting D.S.P. J.S. 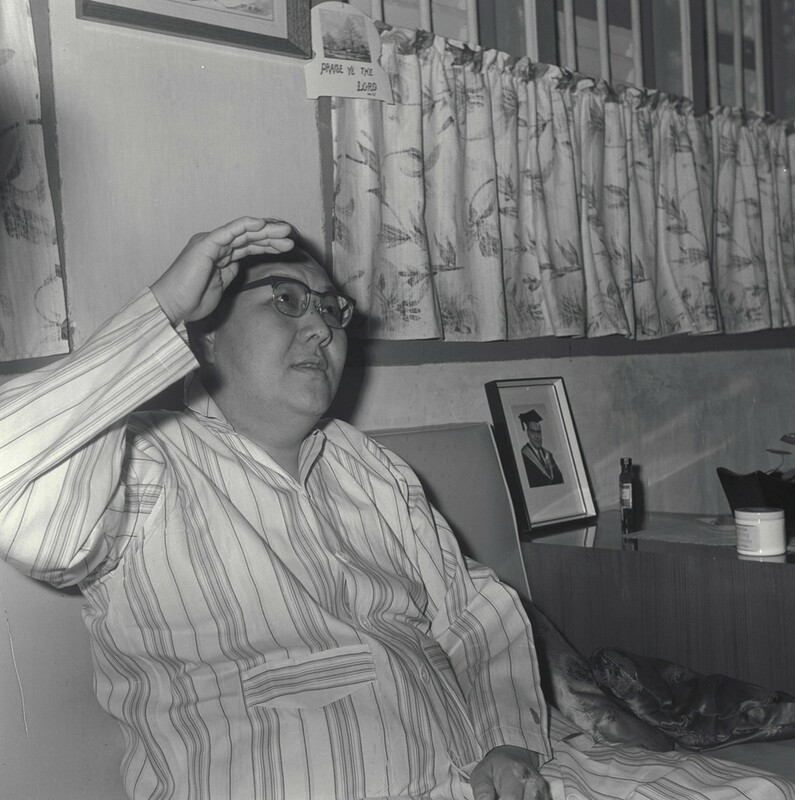 Khosa at the hearing of Macdonald House explosion case. 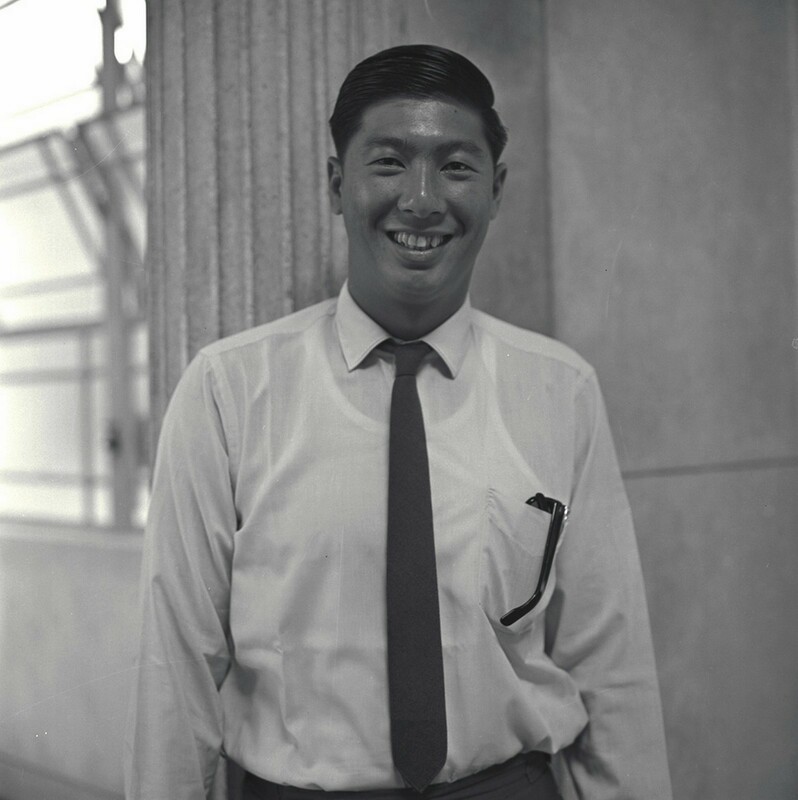 Tan Eng Bock at the hearing of MacDonald House explosion case. 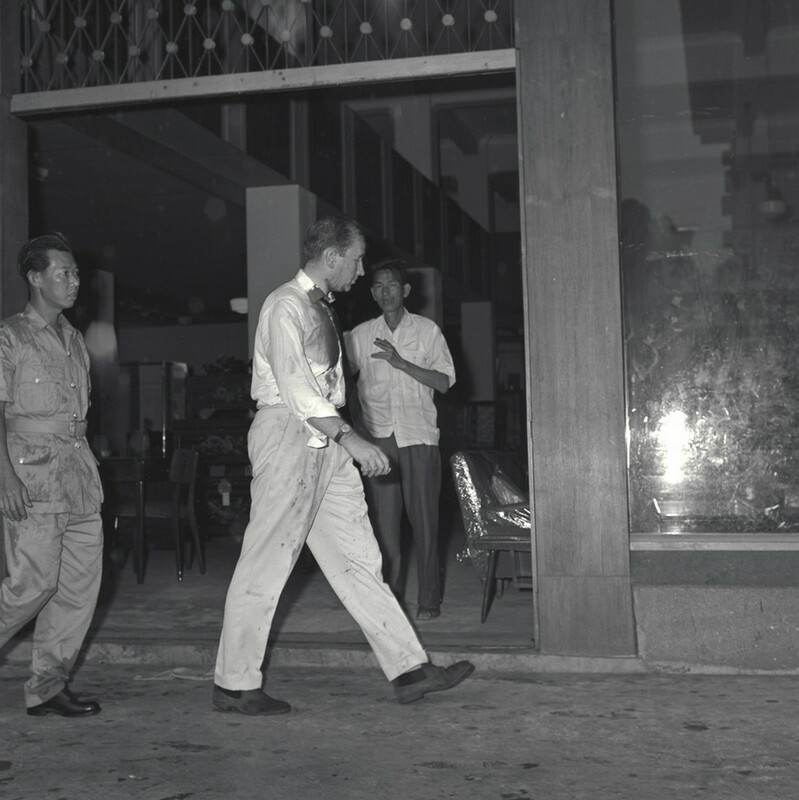 Minutes before the bomb explosion at MacDonald House in Orchard Road on March 10, two visitors had alerted people in the building, Mr Justice Chua was told. 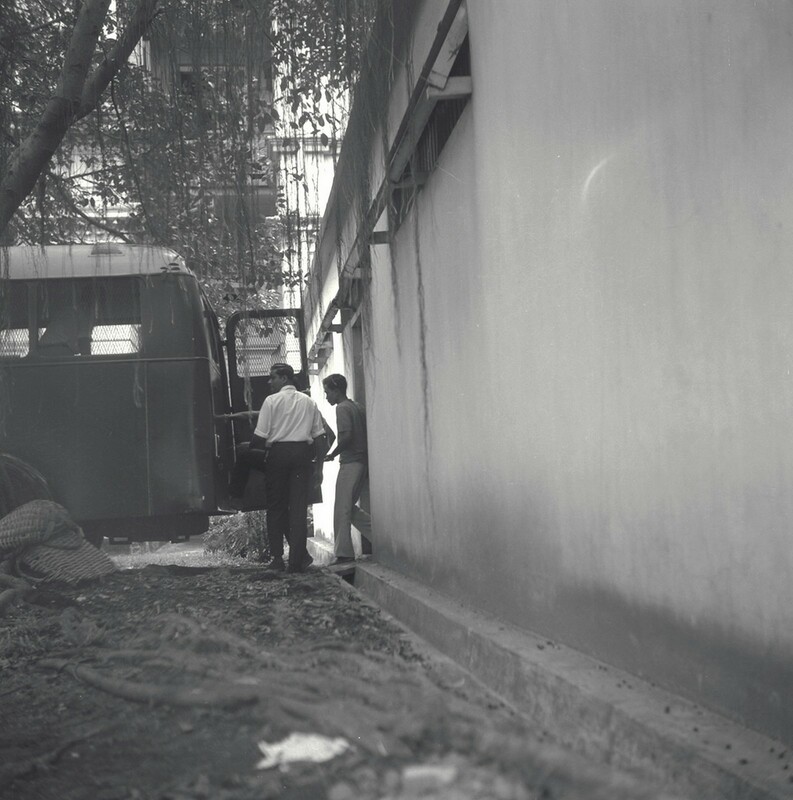 Mr Goh Nam Soon, a food hawker and Mrs Joan Harrison, a housewife told the court how they noticed a peculiar smell in the building. 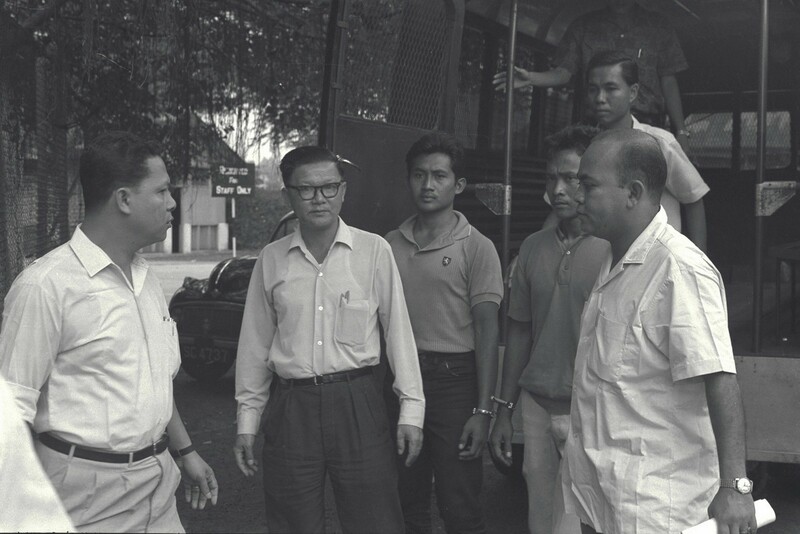 Were two Indonesians, charged with the murder of three office workers at MacDonald House in Orchard Road, wearing jungle green uniforms when arrested at sea after the MacDonald House incident? This question was brought up at the MacDonald House bomb blast trial. 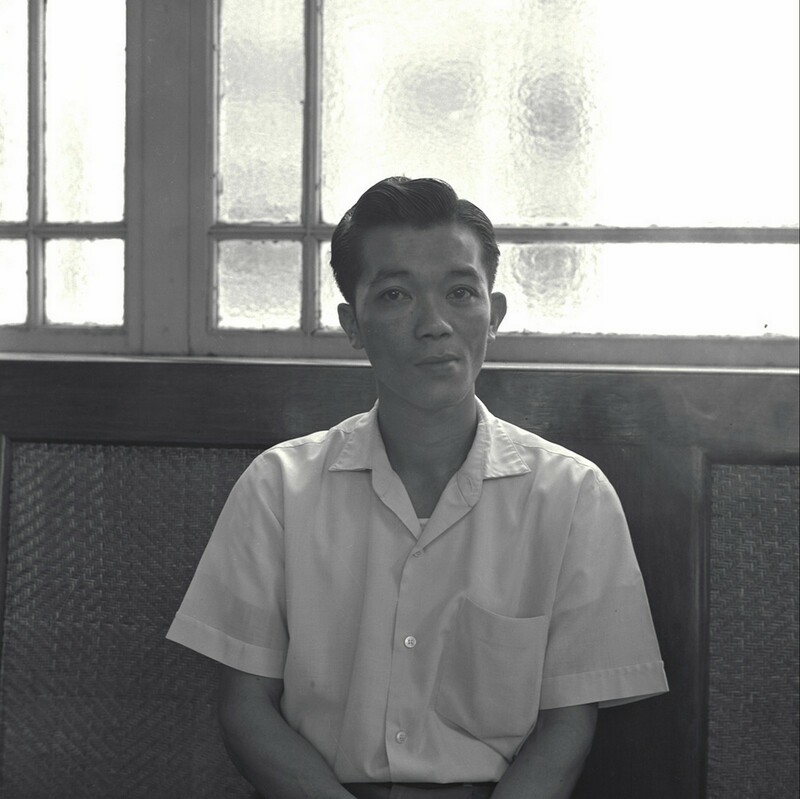 The trial's witness, Lim Ah Paw, a bumboat man testified that on March 13, he picked up the two accussed who had been hanging on to a piece of wood and calling out for help. 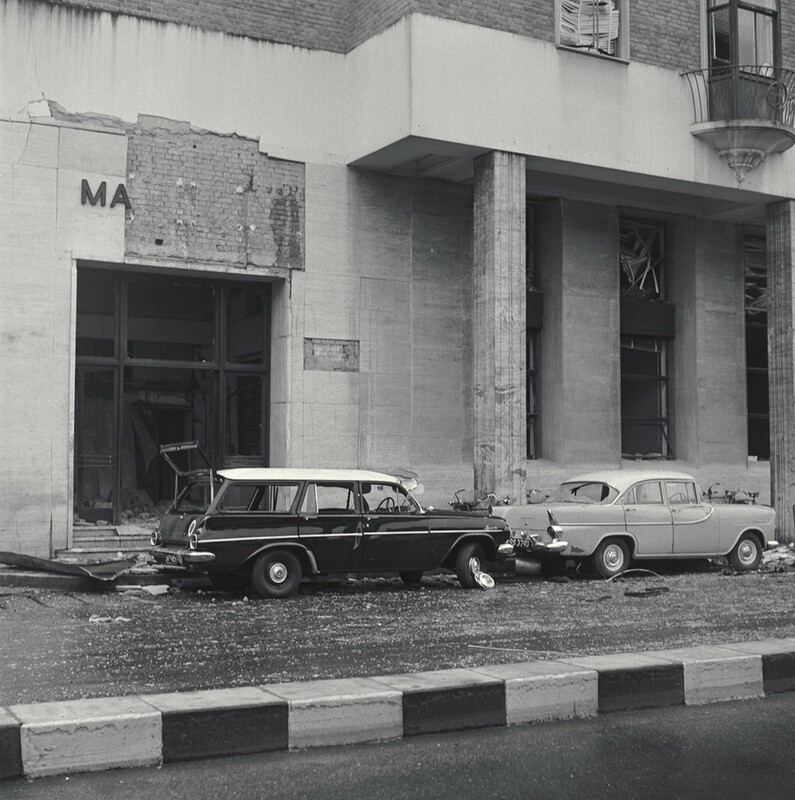 Work began on MacDonald House to repair the massive damage caused by the bomb explosion. 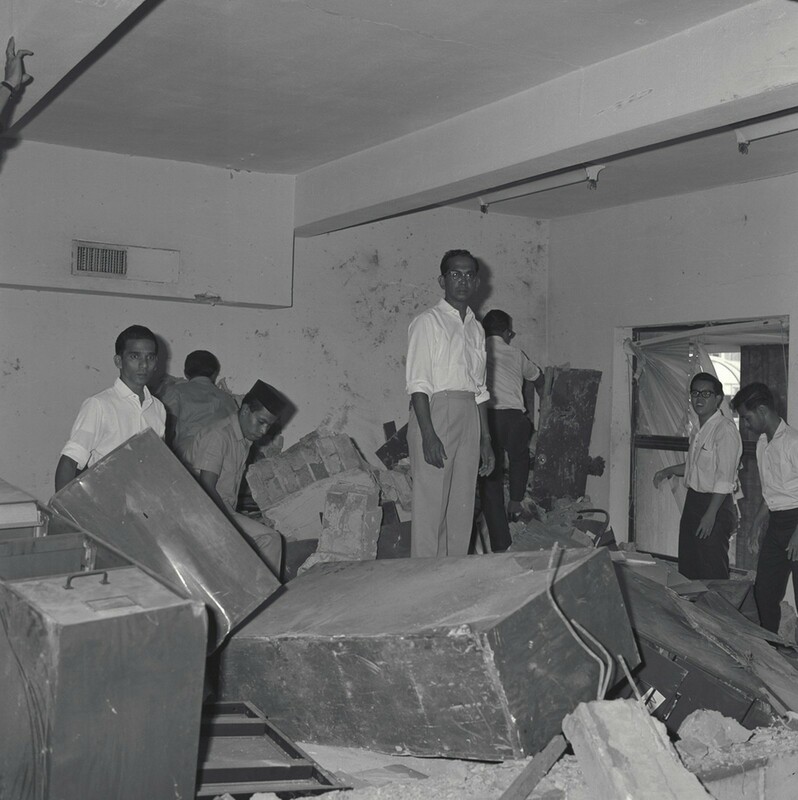 The damaged section was sealed off by a plank wall.